PASSPO☆ took to the skies one last time at Nakano Sunplaza on September 22, 2018, closing the doors on a 9-year career. While this was not the group’s largest venue or longest performance, it provided a powerful conclusion during a weekend full of farewells in the Japanese idol world. The cabin (venue) was at full capacity as the crew (members) took the stage with all engines set to full thrust, taking off with early classics “Let It Go! !” and “Shojo Hikou”. Rising into the upper atmosphere PASSPO☆ beat the air with their fans during “Natsuzora HANABI” and soaring through the clouds to “WING”. Welcoming the “passengers” (fans) aboard for the final flight (performance), the crew kept things moving along with a course of newer songs “7’s Up”, “HONEY DISH”, “Love Diary”, “Pretty Lie”, and “Kucha LOVE”. As the others picked up their instruments in preparation for their Band PASSPO☆ transitions, Natsumi Iwamura explained to the passengers that they had considered performing all of their songs (80+) but reduced it to a more reasonable number for everyone’s sake. Columns of CO2 filled the air as the performance ramped back up with “BABY JUMP ~ Tengoku he no Toujou-bin~” and “WANTED!!”. 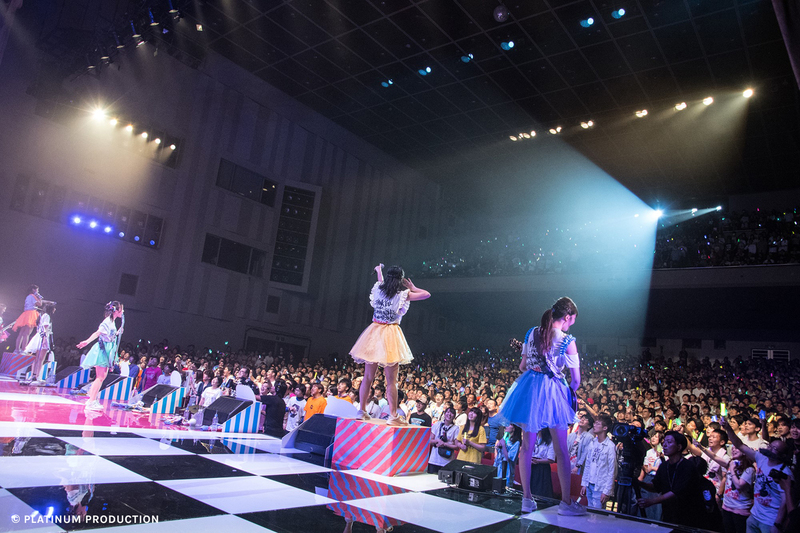 Iwamura and Shiori Mori ran through the aisles during “Candy Room”, with Mori sprinting all the way to the balcony while singing her lines, returning midway through “Material Girl”. “Perfect Sky”, the song which was the beginning of Band PASSPO☆ followed, accompanied by video of rehearsals and their debut performance at Ikebukuro Sunshine City. Fighting through the heavy emotions of the song, Band PASSPO☆ finished strong with an energetic rendition of “Himawari”. A “nostalgic medley” of 5 songs randomly picked from a box followed, PASSPO☆ transitioning smoothly from band mode (“Break Out! !”) to dance mode (“Vivi Natsu”) and cruising down the road with “Go on a Highway” and “LALA Love Train”. Waving good bye with “Jaa ne”, the stage went dark. A single spotlight shined down on Mori as she belted out the opening lines to “Mudai”, releasing an outburst of emotion that reverberated through Nakano Sunplaza as heads banged and fists pierced the air. Continuing on with “「I」” and “You”, the main performance roared to a close with “TRACKS”, the members fighting back tears as they saluted the audience before marching offstage. The encore calls began immediately, a few passengers lifting up banners thanking PASSPO☆ for their 9 years of service. Returning for the encore in T shirts customized by Yukimi Fujimoto, the crew expressed their gratitude before jumping into the foot-stomping rock of “Party like a Rockstar!” as blue and white light sticks transformed the hall into a wide open sky. Remaining true to themselves until the very end, fan favorite “STEP & GO” was accompanied by the antics of Natsumi Iwamura and Anna Tamai (and to a lesser extent Yukimi Fujimoto and Naomi Anzai). Paper stars fluttered down from the ceiling during “Music Navigation” followed by a commemorative photo and bow accompanied by the passengers with hands joined. A second encore call brought PASSPO☆ back to the stage for a final time, beginning with a band performance of “Shojo Hikou”. Captain (leader) Ai Negishi delivered the final announcement, introducing the last song “Bachelorette wa Owaranai”, tears running down her face as metallic streamers rained down on the passengers. Disappearing backstage in the darkness, the members of PASSPO☆ took the first steps into the unknown as their 9-year journey as one of Japan’s most consistent and reliable idol groups came to a close. E01. Party like a Rockstar! Special thanks to Platinum Production for allowing us to translate and publish this press release.